On the 11th of this month of November, at 11:00 AM Paris time, will occur the 100th anniversary of the end of World War I. America suffered casualties of over 115,000 in this conflict, making it the third costliest war in American history, following World War II (over 400,000) and the Civil War (750,000). This sacrifice inspired President Woodrow Wilson in 1919 to ask Americans to recognize “those who had died in the country’s service.” In time, his moral injunction led to Congressional actions that ultimately established in 1957 Veterans Day as we know it today. In times of relative peace, we of course recognize the service of those in the armed forces. In times of war we aspire to more. These aspirations often take the form of serving in hospitals, working in the arms industry, etc. In addition to these activities of material support, however, are ones of moral support to the troops. In the Second World War the United Service Organizations (USO), a nonprofit organization established by request of President Roosevelt in 1941, provided such support. Although many entertainers answered the call, the comedian Bob Hope has become most identified with the USO, so much so that the organization is currently known as the “Bob Hope USO.” He not only entertained during World War II, but also during the conflicts in Korea and Vietnam. Lesser known and even forgotten, however, is Elsie Janis, a vaudeville star who also entertained troops, albeit during World War I. 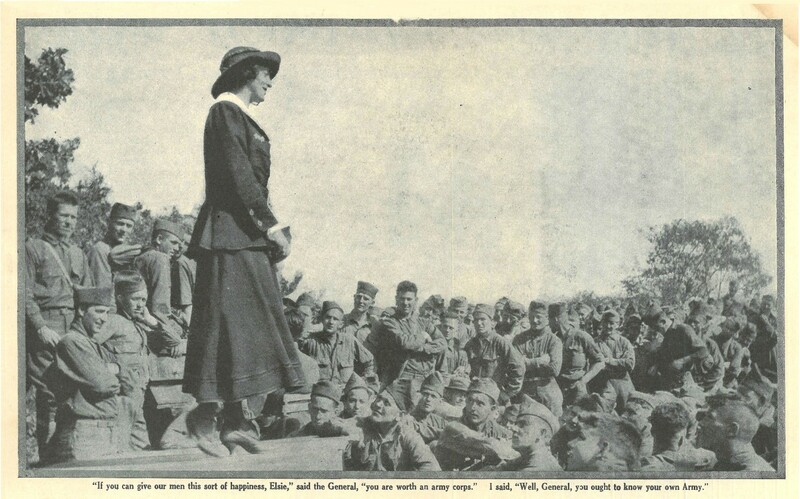 Her rapport and connection to audiences of soldiers was so great that she was immortalized as “the sweetheart of the AEF” (American Expeditionary Force). 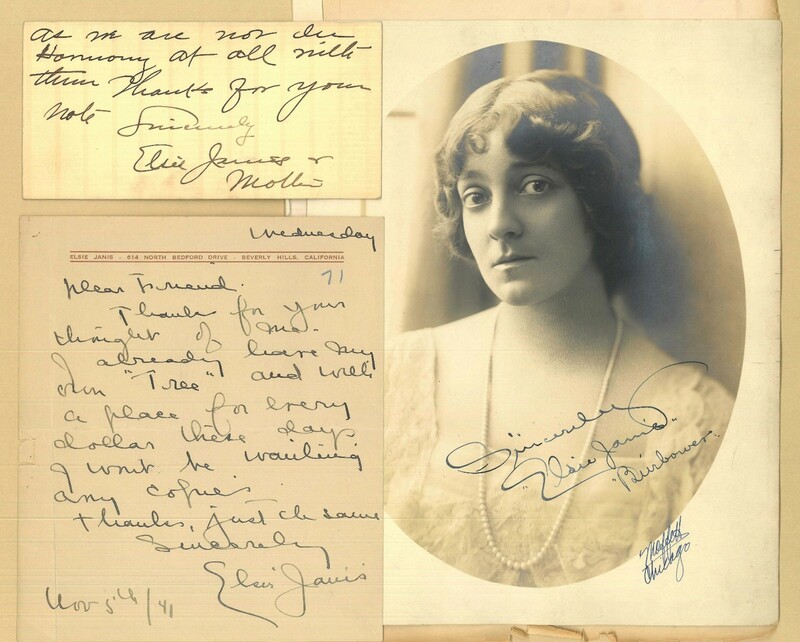 The History Center has recently acquired memorabilia regarding Elsie Janis, including photographs, clippings, and other material documenting both her vaudeville years and World War I service. Elsie Bierbower was born 16 March 1889 in Marion, Ohio, a small town 50 miles north of Columbus. 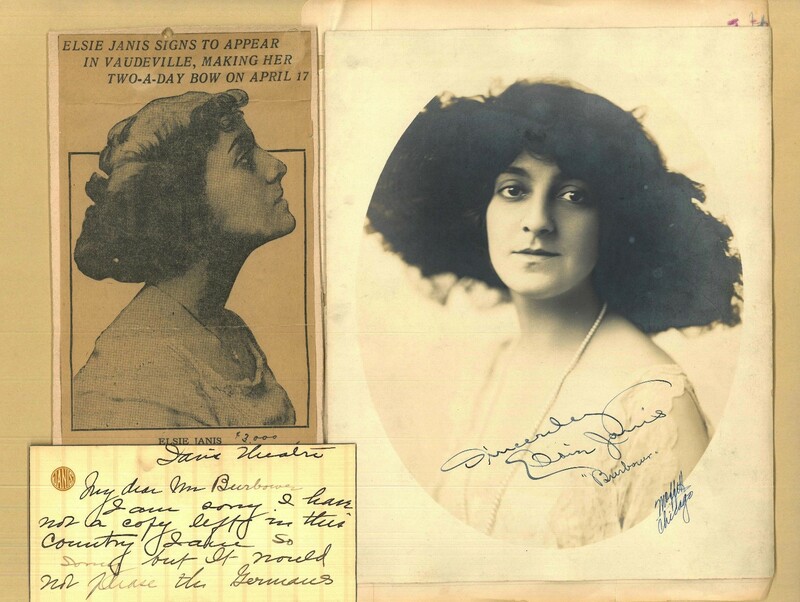 By age 2 she was already performing on stage, and by 11 she attained success on the vaudeville circuit as a headliner under the stage name of “Elsie Janis.” Critical success led to engagements on Broadway and in London, including a number of hit Broadway shows, such as “The Vanderbilt Cup” (1906), “The Hoyden” (1907), “The Slim Princess” (1911), and “The Century Girl” (1916). 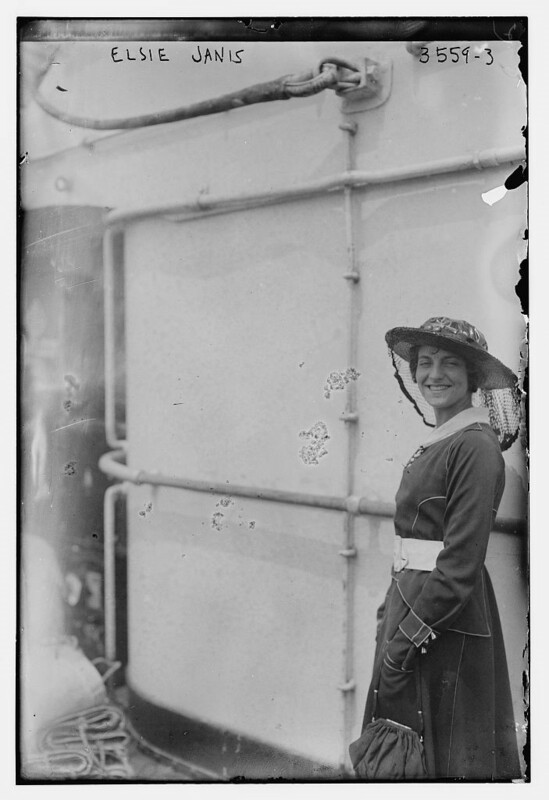 Elsie Janis on the deck of an ocean liner, likely sailing between the United States and England. She tells us in “The Big Show” that she sailed to England on the Lusitania in January 1915.
a precipitating factor leading to America’s entry into World War I. After she “started in at home” with “recruiting, playing benefits, and doing a ‘war-mad’ act in vaudeville, singing patriotic songs, etcetera” she set out for France in 1918. Once in France she performed at military bases, hospitals, and even near the front lines, all the while meeting soldiers, officers, generals, and French people of all kinds. Her narrative of these experiences appeared in her book “The Big Show,” a story enlivened by descriptive details and humor. It also appeared in 1919 as installments in Hearst’s Magazine, along with many photographs that were not published in the related book; many of these installments were included in the collection of Janis memorabilia that was gifted to the History Center, and are sampled in this blog. 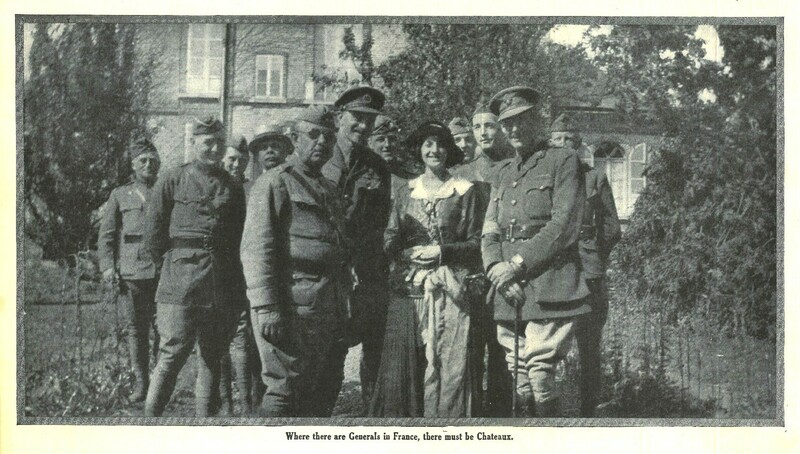 Elsie Janis meeting officers and generals of the AEF. This picture appeared in Part III, “Such Rain — Such Mud!” in Hearst’s Magazine; 1919. 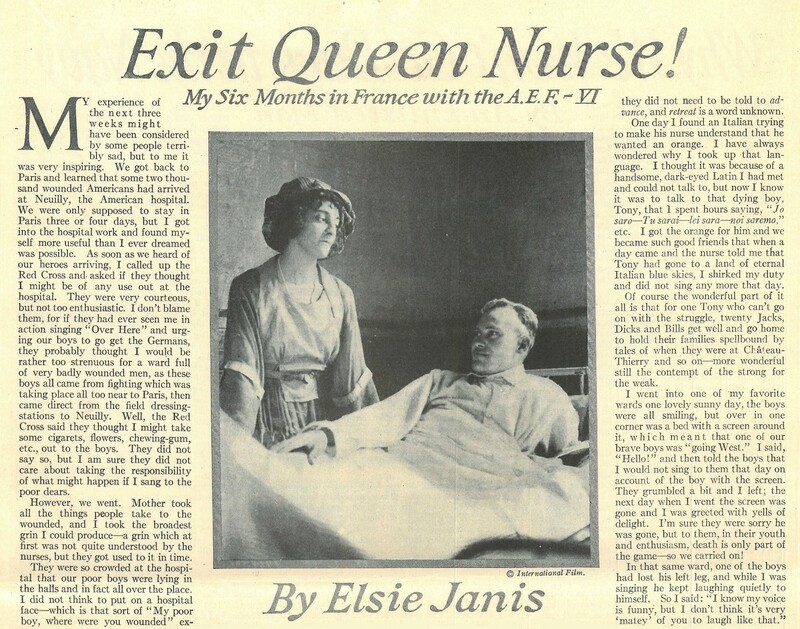 In Part VI, “Exit Queen Nurse,” she tells many stories of her experiences in military hospitals, from which we will excerpt here. Beginning of Part VI as it appeared in Hearst’s Magazine; 1919. This picture appeared in Part VII, “I Meet General Pershing” in Hearst’s Magazine; 1919. In this blog we have learned why Elsie Janis became an entertainer of American troops, how she was able to cope with conditions of war, and something about what she did for American soldiers in France during WWI. 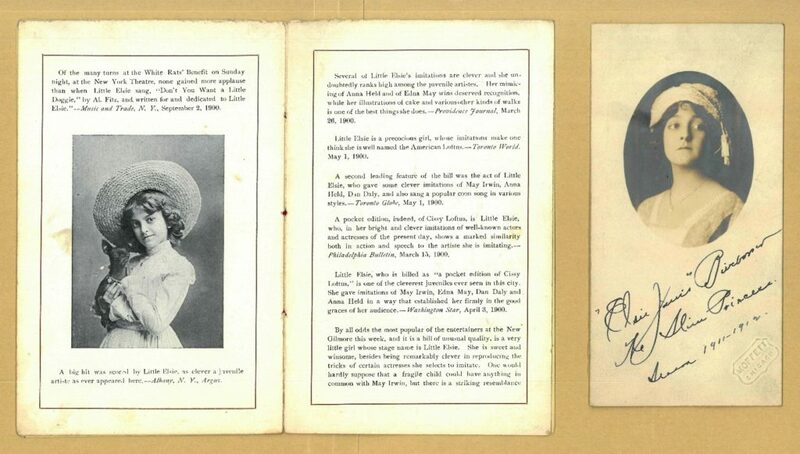 It also provided a sampling of material from the Elsie Janis memorabilia collection at the History Center.